At the beginning of the year, I was supremely confident in the advancement of the Bulls and even predicted that they would make it to the NBA Finals. Still, after the way that they faltered against the Nets on the last day of the regular season, I was questioning aloud the team’s intestinal fortitude, even after beating the Heat in the round 1 opener of the NBA Playoffs. However, by the end of the third quarter on Friday night in game 3, my belief in the Bulls was resurrected. I saw a team that answered every single charge from the defending champs that will ultimately put multiple players into the Hall of Fame with poise and efficiency. 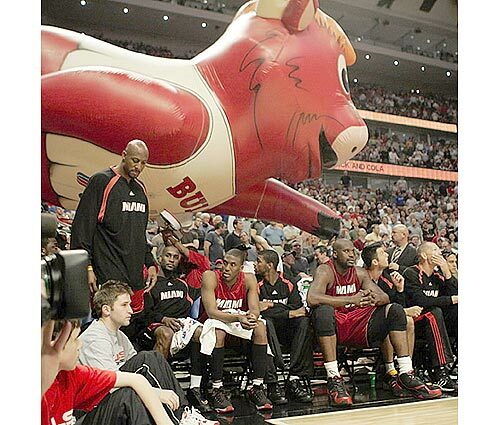 In game 4, they did the exact same thing by taking one last punch from the Heat and then completely knocking them out. I’ll be honest – I thought that this was going to be a 7-game barn burner as opposed to a Bulls sweep. Yet, with the way the Bulls took out Miami with such vigor and strength, I’m ready for a true revitalization of our rivalry with the Pistons. It’s going to be a tough road and who knows whether the Bulls can hang with the Detroit team that they’re modeled after, but I can’t wait to see NBA basketball being played into May in Chicago once again. 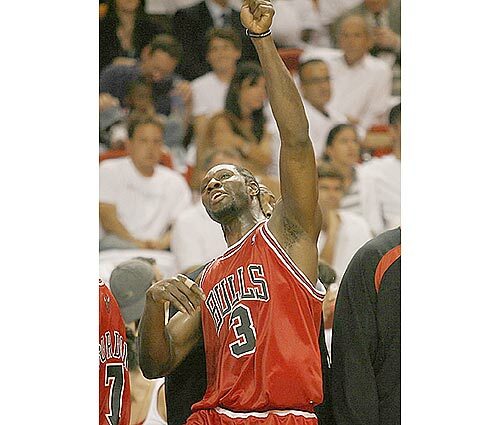 (1) Deng’s Emergence Isn’t Totally Unexpected (ESPN.com) – I don’t agree with Scoop Jackson very often, but I’m right with him in understanding long before the Heat series that Luol Deng would be the key to the Bulls when no one else noticed him. Here’s what I said in my NBA Preview in November: “The real X-factor is how much Luol Deng improves this season. If he stays injury-free, he could very well become the top all around player on the team that’s the go-to guy that the Bulls have been lacking. In my opinion, how well the Bulls will do this season will depend upon the progress of Luol Deng more than anyone else.” That is the first and last time that I’ve said anything right on this blog. (2) ‘Idol’ Gives Back, We Give Up (Moraes on TV – Washington Post) – As a whole, I enjoy the pomp and circumstance of “American Idol”. However, when Elvis was brought back from the dead to do a duet with Celine Dion, I almost ralphed on the couch. (3) The Latest Must-Have for Yuppies: A Blog About the Neighborhood (New York Times) – I grew up as a south side White Sox fan and despised Wrigleyville for its yuppie quotient. When I presented this reasoning to my wife one day, she looked at me increduously, called me out as a hypocrite and basically said that I was one of the biggest yuppies that she had ever met. After feverishly denying this, I then took a look at myself and came to a disheartening conclusion. I have a house in Naperville after previously living only blocks away from Wrigley Field (not Wrigleyville per se, but close enough), got business and law degrees, actually crave Chipotle burritos, would take a foreign luxury sedan over a Detroit muscle car as a dream car any day of the week, don’t mind a Starbucks every once in awhile and would rather go to Ravinia than a rock concert these days. In other words, my wife was right – I have become one of yuppies I used to abhor. Really, I used to be cool… seriously, OK? I’m still a Sox fan, so that counts for something, right? Right??? (4) The Right Pick, Despite Wrong Agent (Chicago Tribune) – The Bears took tight end Greg Olsen from Miami in the first round of the NFL Draft, who looks like a beast, yet all anyone seems to care about right now is that he’s represented by Drew Rosenhaus. The slick agent also represents Lance Briggs, who is pretty much holding up the status of the Bears linebacker core for next year with his insistence on getting a long-term contract into place. Still, the fact is that Rosenhaus has a number of the top players in the NFL and it’s likely the Bears are going to have to deal with him for a long time. I just hope that both parties can work to get mutually beneficial deals into place (unlike, say, the apparent inability of the White Sox to get anything done with baseball super agent Scott Boras). As a side note on the NFL Draft, I’ve been saying ever since that I started this blog that Brady Quinn was overrated (I fail to see how anyone could have reasonably thought that he was in the same class as JaMarcus Russell after this year’s Sugar Bowl), but the way that he dropped down all the way to #22 after being projected to go as high as even #2 made Matt Leinart’s time in the waiting room last year look like a nice Saturday in the park. The Browns would have been insane to take Quinn at #3 and made the right call with Joe Thomas, yet subsequently being able to get the quarterback they wanted much later in the first round (and for a lot less money) was the draft day coup. Also, I enjoyed the fact that the Detroit Lions actually had little choice other than to take Calvin Johnson, who is yet another wide receiver for that team. There was little questioning of this move since Johnson was almost unanimously considered the best athlete in this year’s draft class, but Matt Millen’s development of marquee first round wide receiver draft choices has been about as successful as the long term growth of Mark Prior and Kerry Wood for the Cubs. It’s just unbelieveable that after using high first round choices on wide receivers in four of the last five years, the Lions still fell like that they had a need there. Finally, my gut reaction to the New England Patriots getting Randy Moss in exchange for a fourth round draft pick was a great move. There are going to be voices out there stating that the Pats shouldn’t be bringing trouble into their locker room, but the fact is that the team needs a top flight wideout and they grabbed someone who is still one of the best talents in the NFL. Something tells me that Moss is going to have a bit more success getting back into the end zone with Tom Brady at quarterback instead of Aaron Brooks. Honestly, I’m glad Moss didn’t end up with the Packers as was rumored for the last few weeks. A lot of Green Bay fans might have had a visceral reaction to that thought, but judging by how that team went 8-8 last year, adding a top wideout would have made that team even more competitive immediately. Fans can get over prior enemies pretty quickly (see Dennis Rodman with the Bulls) when they help you win after turning to your side. (5) Michael Jordan Ready To Bag Champaign Coeds (Deadspin) – Those that know me understand that my love for the University of Illinois knows no bounds while Michael Jordan will forever be my idol. So, with the announcement that Jeff Jordan is heading to Illinois, the thought of MJ being on the prowl in Campustown makes me smile. The big news in Chicago this past weekend was that our fair city bested Los Angeles to represent the United States in bidding for the 2016 Summer Olympics with Tokyo and Rio De Jianero probably being the main opponents. Winning the Olympics, which won’t be decided until 2009, certainly won’t be a slam dunk, particularly with the fact of Rio bringing the prospect of the first Games ever being held in South America. That being said, Chicago is well-positioned since Brazil might be putting more resources into a probable hosting of the 2014 World Cup while Tokyo will be at a disadvantage with the close proximity in geography and time to the 2008 Beijing Olympics. Also, the U.S. television broadcast rights are the single largest revenue source for the Olympics and just happen to be up for bid starting in 2016 – something tells me that NBC or another network would pay a hefty premium if the games don’t need to be shown on tape delay in prime time. There are certainly a number of horror stories that suggest that losing cities often end up winners compared to the hosting cities, ranging from financial problems (Montreal taking nearly three decades to pay off its debt for the 1976 Olympics) to terrorism (Munich in 1972 and Atlanta in 1996). In Chicago, the talk also naturally turns to traffic problems, which are bad enough without the additional crush of hundreds of thousands of extra visitors. Still, for all of these potential pitfalls, I believe that being able to hold the Olympics would be a fantastic opportunity for the City of Chicago and could finally change the perception of our city once and for all. Anyone that loves urban environments (I’m not talking about the yokels that complain about how there are too many people and a lack of hunting venues) and has visited Chicago knows that it is on par with any other large city in the world in terms of architecture, culture, economic strength, and vibrant public spaces. For all of Mayor Richard M. Daley’s crazy power trips, he has been relentless in transforming a previously gritty town into a glimmering city with a gorgeous lakefront. Unfortunately, it continues to amaze me in dealing with people that haven’t visited Chicago from both coasts of the United States and foreign countries that they perceive the city being more like Detroit or Cleveland – as in a declining, industrial-based, boring, and unsophisticated Midwestern town (I’m not trying to pile on our Michigan and Ohio neighbors, but that’s just the global perception). I can understand the fascination with New York, which is a world center on so many different levels, but it continues to boggle my mind that places such as Boston and San Francisco, while certainly being beautiful cities, seem to be romanticized in the general public mindset in comparison to Chicago even though I consider the Windy City to have a more energetic and vibrant urban atmosphere than those two towns (and Boston definitely doesn’t have better weather). What I hope an Olympics would do for Chicago is to provide the city the widest platform to showcase its assets and give it a final push to attain the international stature that it has deserved for a long time. The key here is that I don’t believe that Chicago has much to prove, unlike, say, Atlanta did in 1996. Chicago’s world-class urban infrastructure is already in place, so it just needs the attention in a world that largely perceives the space in between New York and Los Angeles as flyover country. The best model of this is Barcelona, which was similarly perceived as an old industrial town prior to the 1992 Summer Olympics even though it had already gone through an urban renaissance. For those that attended those games, Barcelona completely blew them away with its sophistication and beauty to the point where, as opposed to being a largely ignored stepchild to Madrid, it is now a must-see for all visitors to Spain. My hope for Chicago if it gets the opportunity to host the Olympics is that the city can leverage the games to transform its international image for way beyond 2016. (1) Welcome to the Megaprogram Era (ESPN.com) – As I alluded to last week in pointing out that Billy Donovan would be off of his rocker to leave Florida for Kentucky, Pat Forde tackles the subject of top-tier college football schools building up their basketball programs in-depth. I’ve actually wanted to put together a list of colleges that I thought excelled at supporting the two main revenue sports for awhile, but Forde beat me to it here (along with listing those that aren’t doing a good job in one sport or the other despite a lot of time, effort, and money). Please note the very familiar Big Ten school located in central Illinois that he calls “the ultimate football underachiever”. (2) Billy Packer’s Curious Choice of Words (Deadspin) – Shockingly, this interview was with Charlie Rose rather than Jay Mariotti. (3) You Say You Want a Big-Law Revolution (WSJ.com Law Blog) – For those of you that have access to the Wall Street Journal Online, you can check out how some law students put together a “manifesto”, for the lack of a better word, regarding the treatment of attorneys in large law firms. As one of the big-law associates that this seems to be aimed at protecting, I’d say that this is very cute. (4) Vermont Becomes ‘Offshore’ Insurance Haven (New York Times) – The home of Ben & Jerry’s ice cream, Birkenstocks, and insurance companies hacking their tax bills with the tact of Tony Montana. (5) Cubs for Sale, but is Wrigley Field (Chicago Tribune) – As anyone that has worked in the commercial real estate industry knows, new Tribune Company owner Sam Zell is a true genius that makes Donald Trump look like a mom-and-pop landlord. This brings up the interesting prospect of selling Wrigley Field separately from the Cubs in order to maximize what has become one of the most valuable pieces of real estate in the country outside of the coasts. I see the business logic in this from Zell’s perspective and sale-leaseback transactions are pretty common in the real estate world (i.e. a company sells off its physical headquarters to raise cash and then immediately enters into a long-term lease to occupy that same space), but I don’t see why any prospective buyer of the Cubs would want the club without the ballpark. For better or for worse, Wrigley Field is what makes the Cubs organziation a cash cow regardless of how the team performs on the field, so I would think that the future owner of the club would want complete control over what is simply considered to be a high-profile piece of real estate in the Tribune deal. On a related note, my feeling is that the people’s choice of Mark Cuban as owner of the Cubs is far-fetched. Chicago Heights native, long-time Phoenix Suns owner, and former Arizona Diamondbacks owner and Illini basketball and baseball player Jerry Colangelo seems to be a much more likely choice since he is well-versed in the politics of Major League Baseball, which is a more difficult hurdle to get past than having or raising enough cash. I also wouldn’t be shocked if an outsider such as the Dolan family (the Cablevision scions that ruined the Knicks) or Daniel Snyder (the marketing wunderkind that ruined the Redskins) enters into the race since they have more than enough money and the Cubs would seem to fit into their broader media portfolios well. If all else fails, I can see Minneapolis Red Sox start taking up a collection fund to buy the Cubbies up. I’ll stay away from that one, though. (6) What Will They Do For an Encore? (Siberia, Minnesota) – Speaking of Minneapolis Red Sox, here’s a video that he posted that seems even more poignant in the wake of another Ohio State failure against Florida. On that note, my college sports predictions will mercifully be put on ice until the fall.